Analyst firm Vision Mobile has today released its Developer Economics 2013 report, the fourth in the series, revealing which platforms have the highest priority among developers and which platforms make their developers the most money. 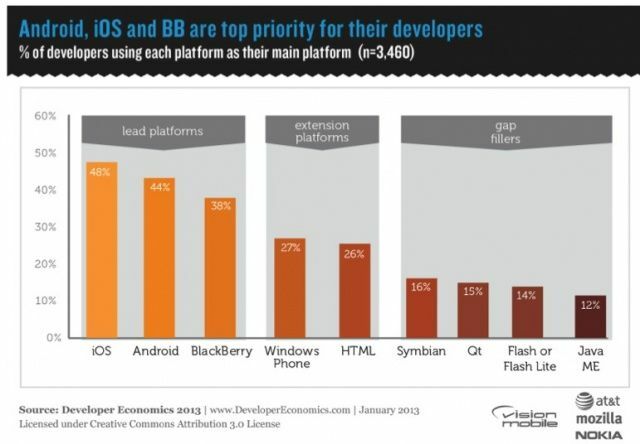 As expected, iOS leads with 48% developers reporting it as their lead platform, followed by Android and BlackBerry. According to the study, 44% developers reported Android as their main development target, while 38% developers named BlackBerry as their priority mobile platform. Windows Phone and HTML are seen by those surveyed as platforms to extend app distribution, and not as a primary target for development. The report also claims that 38 percent of developers in the group of developers surveyed use advertising as their primary business model. The report notes that tablets are also starting to have a similar mindshare among surveyed developers as smartphones, with 76 percent of the developers pointing to the iPad as the best development platform.